Well, the good news this year is that Punxsutawney Phil didn’t see his shadow and that means an early spring is on the way. Of course, Phil is only accurate 40 percent of the time and so we’ll have to wait and see. A higher percentage of time you can count on getting above or out of the valley fog by choosing from several alternatives that don’t involve flying to the Palm Desert. Here in the valley a couple of easily accessible hikes provide a summit experience with blue skies and breathtaking views. First, across town in south Eugene choose from a variety of hikes on Spencer Butte. There’s ample free parking at the trailhead. The well-maintained trail and stone stairways make reaching the summit achievable for people of all ages. 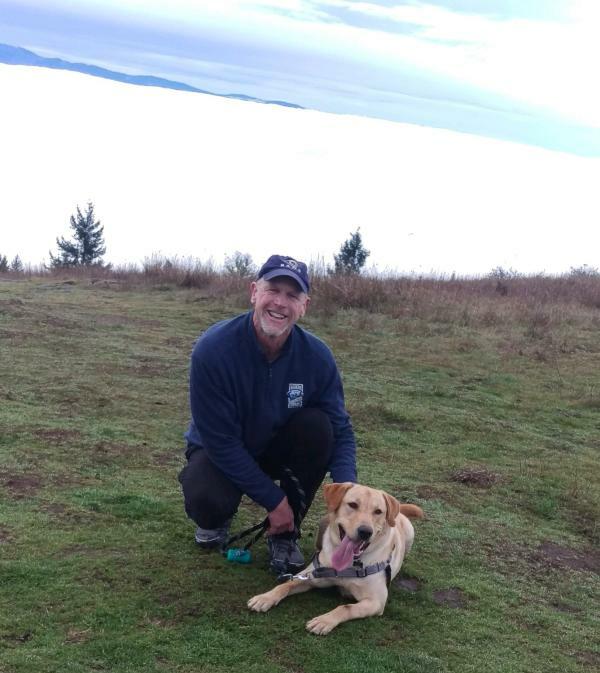 On this Ground Hog Day 2019, "Baxter the Adventure Dog" and I were up for a little more challenging hike and decided to make the short drive to the Howard Buford Recreation Area. Note: Howard Buford Recreation Area is a Lane County Park that charges for parking. It has a pay station or you can access Lane County’s online pass portal and purchase a daily or annual park pass. Offering hiking and horseback riding trails, with numerous routes to reach the Mt. Pisgah summit, this area is a favorite of local hikers and horse enthusiasts. Baxter tackled Pisgah around age 5 months and found that rest breaks were a necessity ascending and descending. But, as an 11-month old he never stopped in either direction. Some smart guy thought running down seemed like a good idea. A word of caution, from the one who is now suffering for the third day from muscle aches so bad that his legs no longer function normally, prepare better for a nearly 2-mile downhill run. 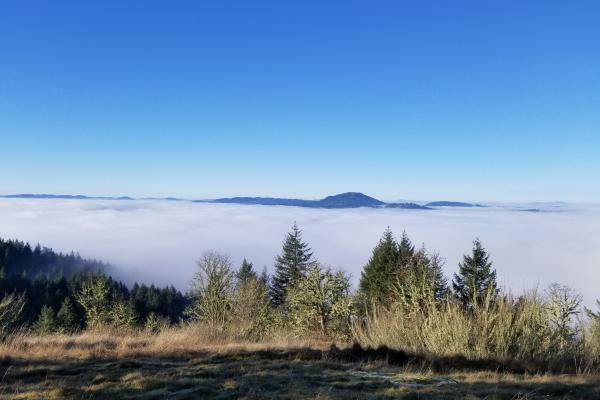 The Pisgah summit provides spectacular views to east, south and west and includes views of the high Cascade peaks to the meandering flows of the Coast Fork of the Willamette River. The fog fills the valleys below giving the surrounding hill and mountaintops a look of floating on cake frosting. 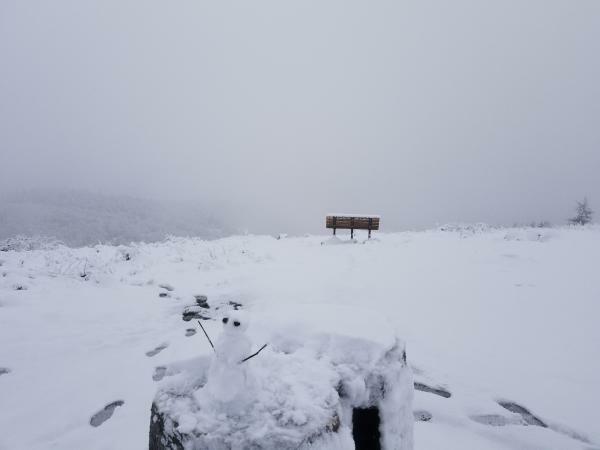 And while the snow level doesn’t often drop to the 1,531-foot Mt. Pisgah summit, it can sometimes delight us with a fresh coat of powder that makes the views even more majestic. If hiking doesn’t appeal to you, there are options to get above the fog that only require a little gas and an hour of driving. First, Florence’s sunny winter days are a secret to many who are new to the Willamette Valley. All it takes is a quick scan of friend’s Facebook pages to learn that valley fog often means blue skies and warmer temperatures in Florence. Head over for a ride on the sand dunes, a round of golf or even horseback riding. With art and music festivals happening throughout the year, you may be surprised with an experience you hadn’t even planned on. The second drive option is a trip east to Oakridge. While you’ll need to pay attention to snow levels, this 60-minute drive is beautiful and as the elevation increases the fog evaporates. Enjoy a day hiking, mountain bike riding or just have a meal and pint of cask beer at the Brewer’s Union Local 180. So, the next time you’re in fog funk know that you have options to experience blue skies right here in the Eugene, Cascades & Coast region.